Improper Stroke Technique: Especially in heavy training, efficient stroke technique helps prevent injury. For instance, when a swimmer does not properly rotate the body while swimming, excessive stress may be put on the shoulders. When in heavy training, this improper repetitive motion can lead to injury. A small shift in mechanics helps avoid this problem. Underestimating the Water Conditions: Whether training or competing, it is important to get information about the area of a swim. Additionally, take time to observe the situation. In some places, shifts in water conditions occur very quickly. 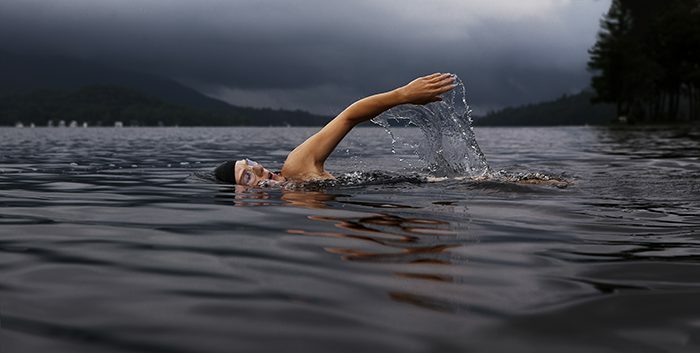 A change in currents or riptides can cause even the strongest swimmer to be taken off course. What is calm one moment might not be calm the next. Rather than rushing into the water, it is best to take time to get an overview of the area. Misjudging Depths: When starting from land and running into the ocean, many competitors use a dolphin type entry. It is wise to take time during training to practice entering. Make sure to be careful the depth is not too shallow to go head first. Furthermore, when exiting the water, it is helpful to know the right time to stand up. A swimmer attempting to stand too early will miss the bottom. At the end of a long, exhausting race, missing footing is frustrating and time- consuming. Additionally, standing too late means one is swimming when they could be walking or running. Making sure the ground is close enough to get solid footing helps assure a solid finish.